AUSTIN, Texas–(BUSINESS WIRE)–Horizon Bank and the Federal Home Loan Bank of Dallas (FHLB Dallas) have awarded $8,240 to a nonprofit devoted to providing financial planning education to low-income individuals and families through personal money and credit management education programs. 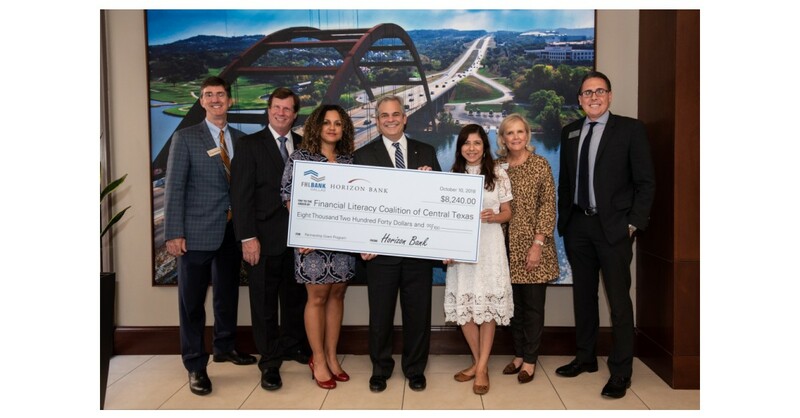 The Partnership Grant Program (PGP) funds were awarded yesterday to the Financial Literacy Coalition of Central Texas (FLCCT) during a ceremonial check presentation at Horizon Bank in Austin, Texas. FLCCT will use the funds to support the nonprofit’s Financial Literacy Summit, taking place in Austin in April 2019. The event will bring together government representatives, bank executives, school administrators and educators, foundations and nonprofit and community leaders to share best practices and successful initiatives that work to eliminate the lack of financial education access in low-income communities. This is the organization’s first PGP award. Horizon Bank Chief Operating Officer Gregg Bennett said FLCCT’s mission to support the community and its economic success aligns with that of Horizon Bank. PGP is a unique program that enables FHLB Dallas member institutions to contribute from $500 up to $4,000 to a CBO, which FHLB Dallas matches at a 3:1 ratio to provide the CBO up to $12,000 in grant money. In 2018, FHLB Dallas has awarded $300,000 in PGP funds through 31 member institutions to assist 32 community-based organizations. Combined with the $114,010 contributed by FHLB Dallas members, a total of $414,010 has been awarded to the organizations. Without the PGP funds, FLCCT would have struggled to expand its programs, Ms. Zuniga said. Horizon Bank, SSB, is a state chartered savings bank established in 1905, and based in Austin, Texas. Horizon, with assets at nearly $1 billion, has branches in Austin, Holland, Salado and Cedar Park. In addition, Horizon’s wholly owned subsidiary, STRATA Trust Company, is located in Waco. For more information, go to horizonbanktexas.com. The Federal Home Loan Bank of Dallas is one of 11 district banks in the FHLBank System created by Congress in 1932. FHLB Dallas, with total assets of $75.9 billion as of June 30, 2018, is a member-owned cooperative that supports housing and community investment by providing competitively priced loans and other credit products to approximately 825 members and associated institutions in Arkansas, Louisiana, Mississippi, New Mexico and Texas. For more information, visit fhlb.com.